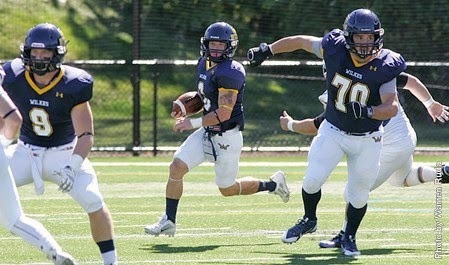 Saturday, October 4, 2014 - 1:00 p.m.
Wilkes University hosts winless FDU-Florham Saturday at 1:00 p.m. at Schmidt Stadium. Wilkes is looking for its second MAC victory of the year after falling 27-14 to Lycoming College last week on Homecoming. FDU-Florham dropped a 30-0 decision to Widener University at home a week ago. Brian Surace (Gettysburg ‘95) is in his fourth season as head football coach at FDU-Florham. Surace is the fourth Head Coach in Devils’ football history. Last season, FDU finished with a 1-9 record overall and went 0-9 in the Middle Atlantic Conference (MAC). During his first season with the Devils, Surace’s squad posted a 1-9 record and a 1-7 mark in the MAC. Surace arrived at FDU from Rensselaer Polytechnic Institute, where he was the Offensive Coordinator for two stints (1999-2004, 2010). During his first tenure at RPI, he helped the team win two Upstate Collegiate Athletic Association Championships and in 2001, the Engineers earned the top seed in the East Region of the NCAA Tournament. In 2003, RPI went 11-2 and advanced to the Semifinals of the NCAA Tournament while Surace was named the American Football Magazine Offensive Assistant Coach of the Year. This will be the 31st meeting between the two schools as Wilkes holds a 28-2 advantage in the series. The Colonels posted a 38-16 victory in Madison, NJ last season. Wilkes is idle next week (10/11) on its bye week before traveling to Chester, Pa. to face Widener University on October 18 at 1:00 p.m. The Colonels continue their road stretch in October on the 25th with an away contest at Lebanon Valley at 1:00 p.m.
With the 41-7 victory over Misericordia in week two, Trey Brown picked up his first career victory as head coach of the Colonels as well as his first Middle Atlantic Conference win. • Wilkes has dominated the series versus FDU-Florham posting 20 straight victories against the Devils dating back to 1993. The last Colonels loss against FDU-Florham came in 1985 when the Devils posted a 23-6 win at home in Madison, NJ. • The Wilkes offense ran an NCAA Division III regulation record 113 plays at Delaware Valley in week three posting a season-high 35 points in the 54-35 defeat. Wilkes tops the Middle Atlantic Conference running 303 total plays through four games this season. Widener follows in second with 289 total plays. • The Wilkes offense is starting to find its rhythm under the high-octane style of coach Brown and the hurry-up spread attack. Wilkes ranks fourth in scoring offense averaging 22.5 points per-game while ranking fifth in total yards (1,247) and fourth in touchdowns scored (13). The 311.8 yards of total offense ranks fifth in the MAC. • Sophomore quarterback Ryan Dailey is the fifth best passer in the MAC throwing for 724 yards on 60-of-123 passing and five scores. His 60 completions ranks second in the MAC behind conference leader Tyler Jenny of Lycoming’s 65 completions. Dailey also showed his dual-threat ability against Lycoming last week rushing for two touchdowns in the contest. • PJ Incremona has emerged as the top back in the Wilkes rushing attack accumulating 142 yards on 40 carries while scoring three times in four games. Incremona is averaging 35.5 yards per-game, good for tenth in the MAC. • The Wilkes defense has forced six turnovers in four games including four interceptions and two fumble recoveries. Jared Powell anchors the secondary with two picks and one forced fumble from his safety position. • Linebacker Tanner Stengel tops the Colonels with 36 tackles ranking third in the MAC in total stops and second in the conference in solo tackles with 26, two behind leader Frank Gaffney of LVC’s 28. Stengel is averaging 9.0 tackles per-game through the Colonels 1-3 start to 2014. • Corner Marcus Leaf has been a shutdown defender on the outside for Wilkes breaking up four passes for sixth best in the league. Leaf also accounts for 14 total tackles and one forced fumble in four games played. • Quarterback Tyler Maurer has thrown for 398 yards on 53-of-85 passing and the lone two touchdowns for FDU-Florham. Both scoring passes have gone to receiver Malik Pressley who has posted 20 receptions for 135 yards and the two scores. • The Devils defense is allowing 27.3 points per-game and over 367.7 yards of offense per-contest. • Rob Savacool tops the Devils defense with 26 total tackles and 2.0 tackles-for-loss. Rich Vazzano is the top pass rusher with nine tackles, 3.0 tackles-for-loss and team-high 1.0 sacks.